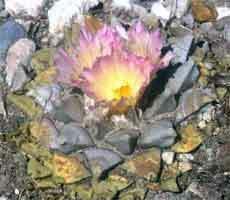 Ariocarpus retusus LRM193, a plant with unusual pink edged yellowish flowers. 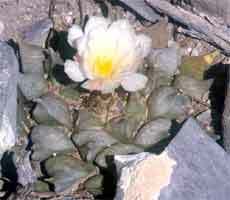 Ariocarpus retusus LRM193, a pink flowered specimen photographed in October 1997. 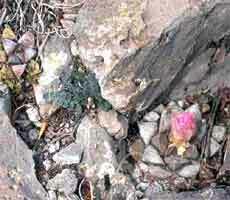 An interesting population of A. retusus in the north of Nuevo Leon, the majority of plants are typical 'furfuraceus' type A. retusus, but pink and bicoloured flowers occur in a minority of specimens as in the Aramberri populations over a 100km further south.